While growing up, a staple around my family's house was the National Geographic Magazine. I have many fond memories of paging through the magazines throughout the years, for the fantastic pictures from all around the world as well as their fantastic maps that seemed to come with every issue. Even to this day, I refuse to throw out any copies that I come across. Indeed, I have a large box in the bottom of my closest of back issues, with a handful from the early 1960s, a couple from the mid-1990s and some from the past decade. The National Geographic is a wonderful magazine, one that has both inspired and opened my eyes to the world. 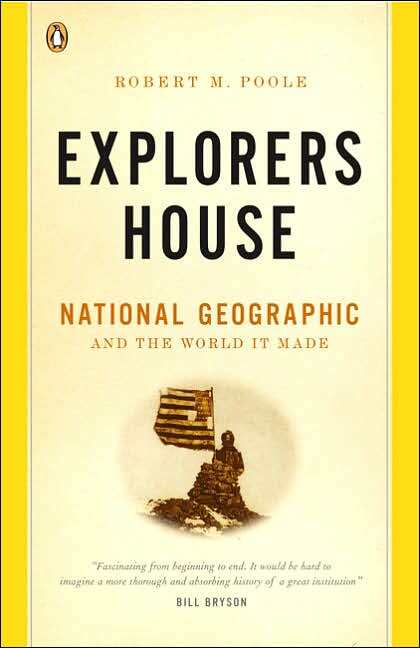 This made the most recent book that I've finished, Explorers House: National Geographic and the World It Made, by Robert Poole, such a fun read over the past month. Chronicling the history of the organization, Poole examines the chain of events that helped to shape the iconic, yellow bordered magazine over the past century or so that it has been around. In 1888, a group of men gathered in the Cosmos Club in Lafayette Square in Washington DC to organize a group that would foster knowledge, geography and an understanding of the world to members, and in doing so, launched one of the greatest organizations that has ever existed. After a short meeting in which the Society's name and bylaws were created, the group began to meet regularly, where they would host speakers, moving from place to place. The official magazine was commissioned later in that year, a collection of maps, charts and articles, and was irregularly published for the first couple of years. Things turned around for the struggling group in 1899, when Alexander Graham Bell, the inventor of the Telephone, along with Edwin Grosvenor, who would take on the Society and work to expand it far beyond its origins in Washington DC. The Bells and the Grosvenors would become dynasties throughout the magazine's history, to the point where Gilbert Grosvenor, part of the fifth generation involved with the Society, is still the head of the board of directors. Poole moves through the history of the magazine largely focusing on the intertwined nature of the Grosevnor family and the National Geographic magazine, charting its rather colored and spectacular history, examining all aspects in concise, and at times, somewhat am apologetic manner, especially during eras where magazine articles reinforce racism or anti-semitism at various points throughout. What is most remarkable is the changes that the magazine has undergone, and how it was an exemplary medium from the start. The magazine is only the most visible part of the Society, which issues grants for scientific and exploration endeavours, as well as working to educate about the world around us. The Magazine, which went from a small part of the Society, became a much more important part of the Society's growth over the years, introducing pictures, and through it, the rest of the world to the United States through the efforts of its reporters and photographers. Photography is what the magazine is known for, and this is indeed a great focus of the book, which notes how the magazine changed as technology improved. As new editors and overseers of the Society came and went for the magazine, each seemed to leave a lasting impression on the magazine, through the style of writing and reporting, photography and overall outlook for the magazine, which garnered millions of subscribers because of its quality reporting and photographs. Going back over some of the earlier issues that I have stashed away is absolutely fascinating, especially when compared to the more current issues. The writing style of the ones from the 1960s tend to be in more depth, longer, written in the first person and tends to be far more upbeat in topic, while newer issues take on a far more critical look at the world around us, examining conflicts and problems around the world in shorter, more report-like articles. One thing that has remained constant between them is the stellar photography that helps to reveal the world. Explorer's House is a fantastic read about a fantastic organization, one that has touched many points in history, from the discovery of the North Pole, the first ascent up Mount Everest, the first man on the Moon and almost everything in between. With magazines and newspapers around the world seeing drops in readership and advertising revenue with the introduction of new media, it will be a hard time for the magazine, but I for one am inspired to resubscribe after lapsing for years.